I love to cook and to do as much as I can by scratch, and I thought it would just naturally extend into baby food and baby cookbooks, etc. Yeah, whatever. I spent all this money of containers for baby food, baby food cookbooks, baby food cooking flashcards of recipes, blenders, freezable trays. I went ALL out! I was going to cook for this baby and she would love it and we would have a grand old time. Then reality set in. Mina barely ate any solid food, predominantly nursed and when she wanted food, it had to be store bought. I tried so hard to replicate Earth’s Best sweet potatoes! Mina would have none of it. I think the best advice to a new mom when considering baby food books is this: go to the library, check out ALL the books you can find, try them and then when the baby likes more than ONE recipe from a book, go and order it at TKE ( it will come in faster than Amazon!) and be satisfied that you didn’t waste a ton of money. Now that Mina is a toddler, we cook together and she LOVES to cook and make up her own recipes. Just the other day, we made cookies and she decided on what to put in and which spice to choose. “Mama, I need to SMELL them! 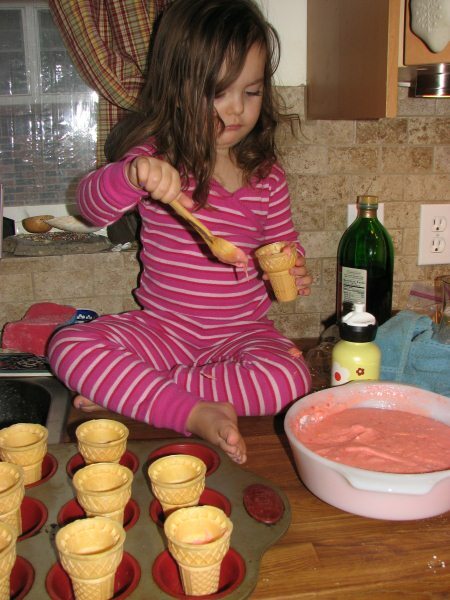 Mama, I need to TASTE them!” I look at toddler cookbooks with an eye of caution. Right now we read my cookbooks together and we make up our own recipes without cookbooks.